Russian President Vladimir Putin and his South Korean counterpart Moon Jae-in attend a meeting during the Eastern Economic Forum in Vladivostok, Russia September 6, 2017. 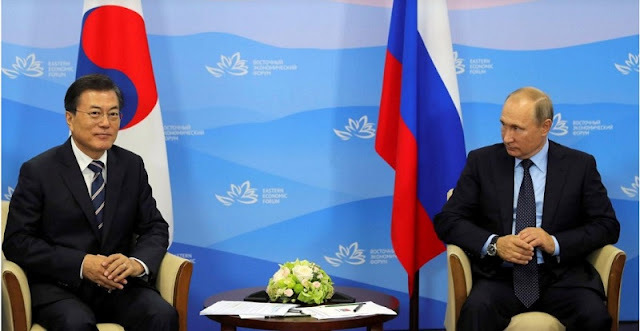 SEOUL - South Korea’s President Moon Jae-in said on Wednesday he and Russian President Vladimir Putin shared an understanding that resolving the North Korea nuclear issue is a top priority for development in East Asia. Moon, making the comments at a joint media conference with Putin after a meeting in Russia, said the Russian president expressed his full support for South Korea’s efforts to handle issues related to North Korea. South Korea’s President Moon Jae-in said on Wednesday he and Russian President Vladimir Putin shared an understanding that resolving the North Korea nuclear issue is a top priority for development in East Asia.